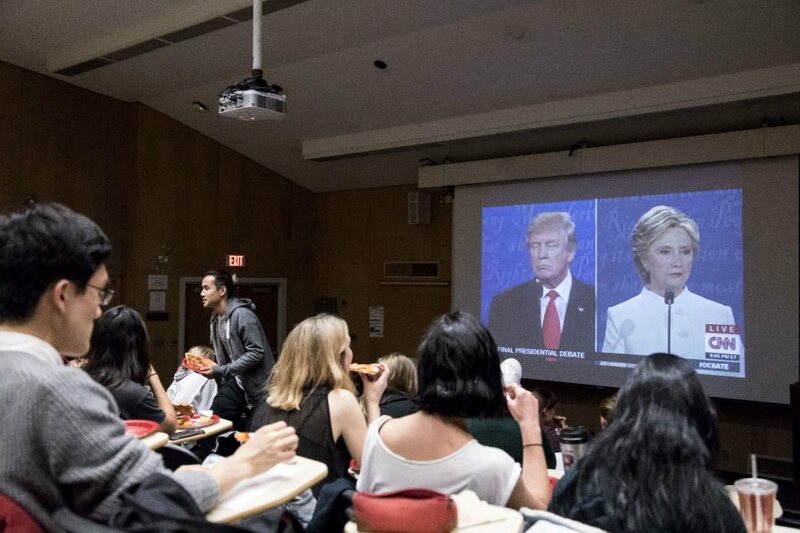 Though fall break made for a small crowd, the reactions were big in the Filene Room as a viewing party scrutinized the third and final presidential debate on Oct. 19, 2016. Julia Mason ’17 of Niskayuna, N.Y., had seen only highlights of the previous debates before watching the final debate in its entirety. “It is frustrating to me to see a lack of attention being devoted to actual policy plans or issues” said Mason, referencing the litany of pressing topics like climate change and immigration that have gone largely unaddressed in the debates. In two weeks, they’ll do just that – and many in attendance chose to register here rather than at home. “I decided to register here in Maine because I want to vote on the day, in person,” said Mason. The viewing was sponsored by the 2016 Election Season Lecture Series.